In the heart of Glenlivet and the Speyside Highlands. Ideally situated for the Speyside Way walking holidays, fishing in the magnificent River Spey, the River Avon (pronounced A’an) and the River Livet. Thistle Dhu Bed & Breakfast is perfectly located for many of the distilleries on the world famous Malt Whisky Trail. The Glenlivet distillery is only 2 miles away! The Glenlivet Mountain Bike Trails are nearby and the Lecht ski centre is only 15 miles away. Mobile phone and Sat Nav reception can be patchy so we strongly recommend taking a note of directions and checking a map before you set off. Its a good idea to print a local map with directions to have with you. From the A95 at Ballindalloch, take the B9008 towards Tomintoul. After 5.8 miles at a sharp right hand bend in the hamlet of Auchbreck, turn left onto the B9009 for Dufftown. After 300metres, Thistle Dhu B&B is the last house on the left as you are leaving Auchbreck. 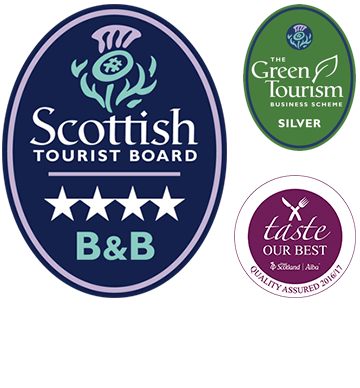 Thistle Dhu Bed & Breakfast is in the heart of Glenlivet and the Speyside Malt Whisky region. Bordering the Cairngorms National Park Thistle Dhu B&B is perfectly located to visit many of the distilleries on the world famous Malt Whisky Trail as well as for fishing, cycling, mountain-biking, golf, walking, skiing and more!